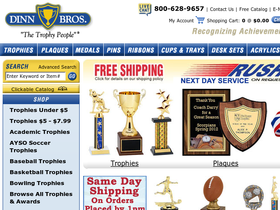 Visit Dinn Bros. online at DinnTrophy.com for one of the leading trophy and awards manufacturers in the country. Dinn Bros. offers a wide and impressive selection of trophies, plaques, medals, and other fine recognition products for any occasion or event. DinnTrophy.com offers awards for any form of recognition, whether it is academic, sporting, as an encouraging motivator for a deserving employee, to honor a special member of the community, or to mark a retirement. Save money on your next trophy purchase with DinnTrophy.com discounts, DinnTrophy.com coupons, DinnTrophy.com promotions and DinnTrophy.com savings from 58Coupons.com. Check out DinnTrophy.com and you can save $100 off your order of $1500 or more. Use coupon code to save. When you spend $100 or more on DinnTrophy.com, you'll qualify for Free Shipping. Click link to save today. Use this coupon code at checkout to save $50 on your purchase of $1000 or more from DunnTrophy.com! DinnTrophy.com offers Free lettering on their trophies with up to 40 letters per trophy. At DinnTrophy.com, you can find Baseball Trophies for as low as $3.75. DinnTrophy.com has a wide variety of medals starting from as low as $0.95. Don't miss out on the web specials from DinnTrophy.com where you can find up to 45% savings on select items.